Star locks are used to help keep wooden poles from splitting from the top. These little beauties are called Star-Locks. Their purpose? To keep the top of a wooden pole from splitting. Splits in poles do not necessarily reduce the overall strength of poles, but can create problems with the additional weight of pole top attachments like cross arms and insulators. Dawson PPD’s pole supplier installs the Star-Locks before they arrive. The device, which resembles a cookie cutter, is pounded into the top of a pole. 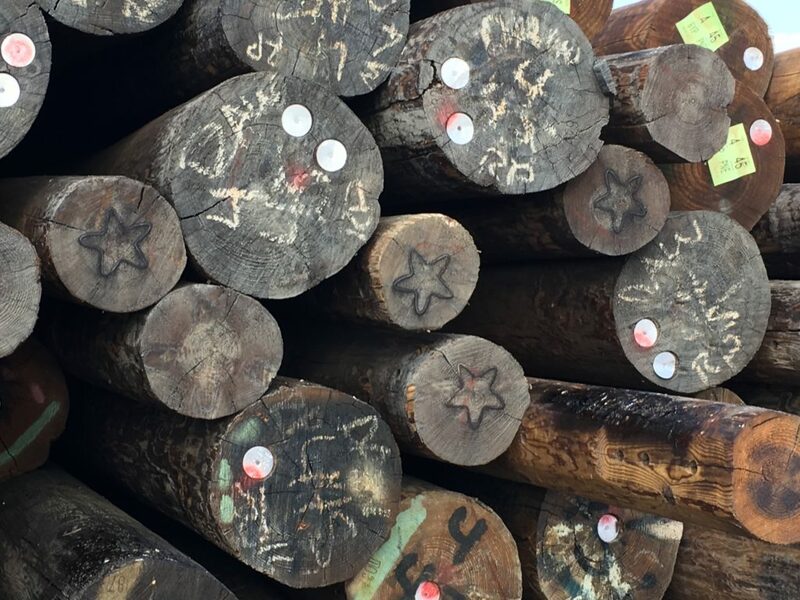 “The Star-Locks are used in all species of wooden poles but are more common in Douglas Fir and Cedar poles,” said Jerry Hobelman, Dawson PPD Manager of Purchasing, Facilities and Fleet. The original creator of the Star-Lock is the Washington State-based Bayne Company. According to the company’s website, the Star-Lock is made of 14-gauge steel. The unique shape of the star is designed to “change the stress pattern that occurs when wood fiber shrinks and expands.” The five points on the star crosses internal growth rings at a gradual angle, pulling the wood rings together. The average lifespan of a wooden pole is 35 years, which leaves these stars plenty of time to shine.